To keep your lawn in tip-top condition it will need to be scarified from time to time. This normally takes place during the months of March/April or, more commonly, in the late August/September period. 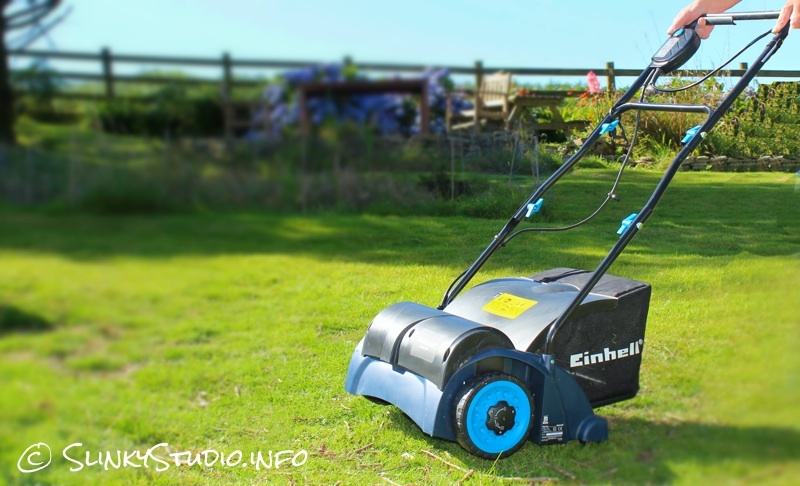 So we are trying out the Einhell BG-SA 1231 Dual Purpose Electric Scarifier/Aerator just in time for late August. The first thing we note is that it is very easy to assemble the handle and collecting basket, and when assembled the machine is robust looking and well-made; just as we have found is the case with all the familiar blue and black products from the German-based company Einhell. Being mains electric operated, it includes 10 metres of cable attached. These scarifier/aerators come with alternative rollers which can be changed easily via two Allen screws for which a correct key is supplied. Both rollers have a working width of 31cm. We started by using the scarifying roller which has 7 double sets of 3 sprung steel tines. We set the adjustable depth to position 1, which reflects a scarifying depth of 3mm. There are four settings available up to a depth of 9mm and these are set via an adjustment toggle on each front wheel. The adjustment is easy, but beware of setting too low unless you are considering a complete re-seeding. Well, the Einhell 1200w motor had no problem working across our lawn and we soon discovered, as if we hadn't already noticed, that there was a considerable thatch of moss and weeds to be extricated. The collecting bucket filled within a few metres and we were having to empty it quite often. As the 28 litre collecting bucket is not that big, we soon realised that it is better to scarify the lawn without it, and then go over the lawn with the mower to pick up the loose moss and weeds. As with many older lawns, ours has been allowed to become quite out of condition, so probably has more thatch debris than anticipated, judging by the size of the bucket included. Following the scarifying procedure our lawn looked pretty scruffed up, but we will sow some new grass seed into the barer patches and know that within a short time the grass will grow thicker and healthier due to the scarifying. Carrying out this scarifying procedure using this electric Einhell was so much quicker and more complete than using a hand rake that it is difficult to compare, but it was also a great deal less tiring! Next we changed the roller quickly and easily for the aerator. This has 8 double steel fixed blades. The idea of an electric aerator is that it cuts into the soil and, by doing so, allows water to more easily penetrate, loosening and allowing oxygen into compacted soil and also tending to remove the thatch of moss and weeds as well. By using this on a different lawn to the aerator we noted that the outcome was similar, although the aerator obviously digs fairly solidly into the soil. 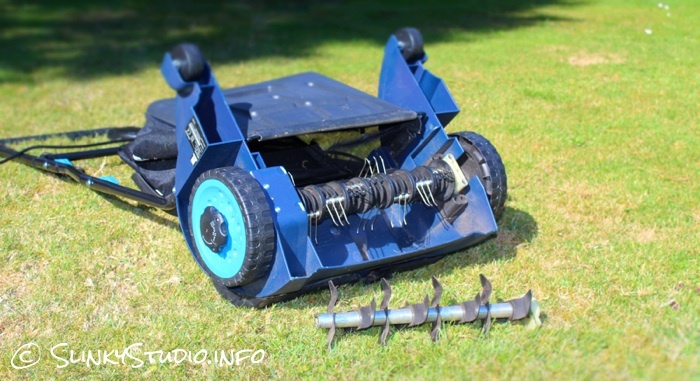 Aerating of lawns can take place more frequently throughout the year to encourage healthy grass growth, but really you would need a decent grass before using this electric aerator in the summer months; either that or be prepared for a scruffy looking lawn whilst the 'thatch' is removed. Once used, the Einhell Electric Scarifier/Aerator can be stored using a minimal space because the handle collapses at two points, folding neatly across the driving unit. This seemingly small thing is important because storing all the different pieces of modern gardening equipment can prove quite a headache. Whether scarifying or aerating, this is a solid machine that matches the task without faltering. 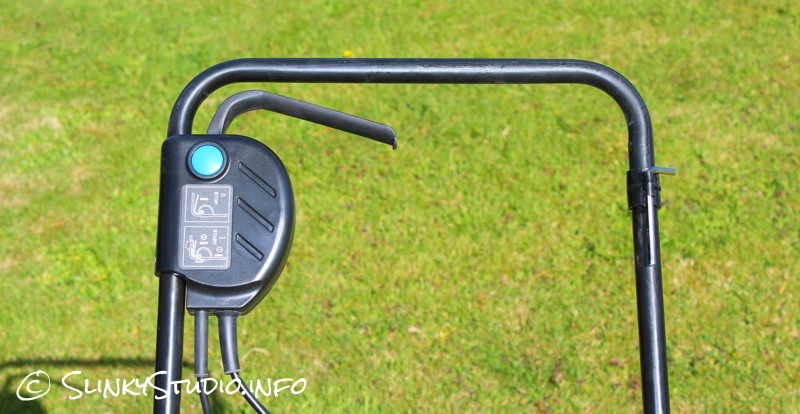 The steel tine hooks picked up odd smaller wind-blown debris that had settled on the grass and the motor powers through its task with a low output of 85db. All in all, at a retail price of around £85.00, it is a pleasure to use and makes something that could be an onerous task become reasonably quick and simple.